In his witty book The Devil’s Dictionary, the late nineteenth social critic and satirist Ambrose Bierce defined politics thusly: “A strife of interests masquerading as a contest of principles. The conduct of public affairs for private advantage.” He being dead yet speaketh. Certainly, politics in America today would be similarly defined by many people. I thought about Bierce’s definition recently, after a long conversation with someone who wanted nothing to do with politics. His final words on the subject, said with great conviction, were, “I don’t believe in politics.” End of conversation. Seen that way, certainly politics has an essential role to play in the proper functioning of a city, country, state, or nation. James Skillen, the president emeritus of the Center for Public Justice (Washington, DC), and a leading political theologian of our time, has a lot of sympathy for people who are mad as a hornet at politics and want nothing to do with it. But he goes beyond sympathy to solutions. Skillen calls for us to rethink how we understand politics and government. This we can do, he says, if we take time to reflect on important, and often ignored, questions, such as what is government for and how should its responsibilities be properly exercised? And what responsibilities are we as citizens to have in political life? Answers to such questions aid in discovering what government should be. If we don’t know what government should be, how will we be responsible citizens? How will we know what our politicians should be doing? This is true of all other areas of life as well. If we don’t know what families or businesses or schools are for, how will we know how to run them for the good of society? How would we know what parents or managers or educators should be doing? As parents, managers, or educators, we don’t begin from scratch. From childhood we are situated in a cultural context and have absorbed, or been taught, ideas, values, and principles about parenting, managing, and teaching in that context. If we had lived in ancient Greece or feudal Europe we would have had quite a different view of these areas. In whatever age we are talking about, including in America today, we cannot avoid asking how should we responsibly engage in these areas? Of political life, Skillen writes that one of our big problems is that we tend to think more in terms of what government can do, rather than what it should be. And he has thought long and hard about what government should be. His answer in The Good of Politics, his most recent book, is to understand politics and government as “political community.” And he goes further, offering a vision for developing “just political communities,” whether they are local, statewide, or national. It’s a good vision, worthy of developing and acting on, whether we are fed up with politics or running for office or somewhere on the spectrum between the two poles. Anyone who cares about the good of this country should take Webster and Skillen up on it. Charles Strohmer writes about politics, religion, international relations, and diplomacy. He is the author of several books and numerous articles. This editorial originally published in The Mountain Press (Sunday, February 18, 2018). 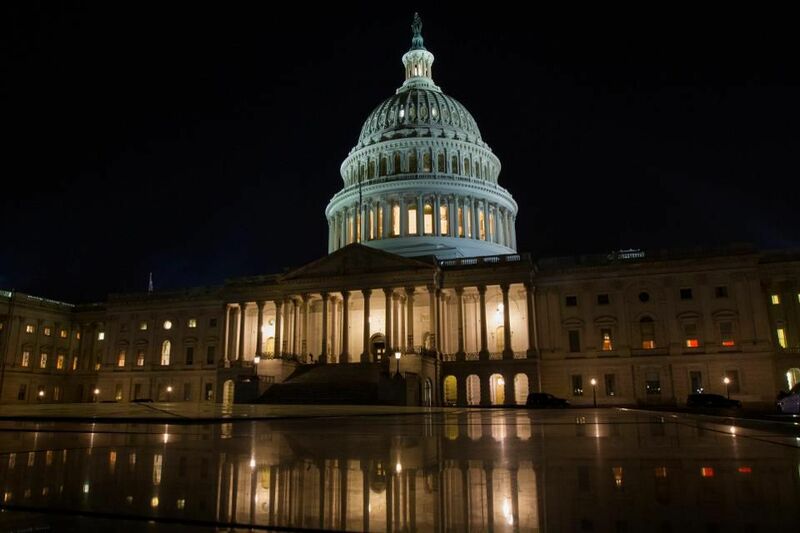 Images: U.S. Capitol/AP Photo John Elswick. Human eye, via Creative Commons, (Cesar R). This entry was posted in MOODS & TUDES TODAY and tagged Ambrose Bierce, James Skillen, Noah Wesbster, politics, The Good of Politics by Charles Strohmer (c) 2014. Bookmark the permalink. This guys asking a worthwhile question about what just parliamentary/congressional representation should look like. I may have missed something but if he is suggesting that in the governance of a State of the Union the entire State should be considered as one electorate – as with the manner in which the Federal Democracy will also consider itself as one electorate – then this seems worth considering. My worry is whether he is also challenging the “winner take all” mentality, and adopts a PR standpoint that would allow for more than a two-party or a two-party preferred system. If he is adopting PR as well then he may be onto something. Political parties need to be provoked to be explicit about their views for the reformation of the political system including reforming the system of representation in parliaments/congresses etc. I’m of the view that one of the evident weaknesses of modern/post-modern political parties is their failure to present themselves as parties – electoral competition between candidates should also include their divergent and competing appeals to the electors as to the proper role and function of political parties and political party membership. As it is they are too often functioning as self-appointed elite power-brokers that avoid coming clean about their own political vision for their country and are simply oriented to getting their candidates elected next time or the time after next. And it has even appeared in the NYT. Will wonders never cease. Well, this reminds me of Jezebel… wife of Ahab. Wicked politics… Unfortunately good politics are missing in my country.